It's rec letter season again! I just finished my second rec letter of the school year, and I thought I'd share what I give to students when they ask me to write a recommendation letter. It's nothing fancy, but it (usually) gives me a lot of good info to go on. Students must ask me in person to write a letter. If I get an email from an outside source saying a student has request a recommendation, but the student has never talked to me, I simply wait for the student to tell me what it's about. If the student never does, the student doesn't get a letter from me. If the student (or student's parent) emails me, I respond by saying something like, "Please see me after class. I require all students to talk to me face-to-face if they are requesting a recommendation letter. I also have a short form for you to fill out." I try to get these written as quickly as possible. Weekends are my time to write them. I limit myself to 2-3/weekend. But, if I haven't hit that limit, I generally do write the letter that same weekend. I don't like having these hang over me. I dread writing rec letters. I dread it so much. They can be very stress-inducing for teachers especially when we know our kids have incredibly lofty goals. That said, once I start writing a letter, I have so much fun with it. It's really enjoyable to get to brag on the amazing kids we have. Furthermore, it's a true honor to be asked to write these, I think. Please copy and paste these questions as well as your answers into an email (send to [my email address here]). The more details or specific examples/stories you provide, the better letter I can write for you. · Non-school activities, volunteer positions, jobs, etc. · What do you consider to be your greatest strength and why? · What do you want to study in college and why? · What is an obstacle you have faced in the past or are currently facing and how has it shaped you? · Name a hero of yours (personal, historical, or fictional) and explain your answer. · Any experiences that stand out during your time at Union? · Anything else that would be important for me to know? And that's it. Again, nothing fancy, but it's the best thing that's worked for me after a few years of writing a lot of letters. This is one of the nights I dread every year. The last night of summer. The night before school starts. In the morning, I'll meet a hundred and forty new people with whom I will share a classroom...and hopefully my heart. The introvert in me squirms at the thought of tomorrow. I wonder how in the world me--little me--ever got placed in this big, beautiful, bold school. And that's when You reminded me: I was placed. I was placed here by You. This was no mistake. So, here we are again. Year Nine. And my insecurities are basically the same. Will they like me? Will they listen to me? Will they learn from me? Will they get along? Will they feel safe? Wanted? Welcome? My prayer is that You would bond these kids and myself together. I pray for deep relationships, not surface-level knowledge. I pray for moments of true academic achievement and also moments of deep, uncontrollable laughter. Grant me the energy and the enthusiasm that these Loves are worthy of. Give me grace for myself when I still fall short. Grant me the discernment to know when a kid needs a hug. Give me grace for myself when I miss that opportunity. Grant me the creativity necessary to make math fun and engaging. Give me grace for myself when I'm boring as hell. Grant me the patience needed to answer the same questions all day long. Give me grace for myself when I sigh out loud. And grant me the courage to apologize for that sigh immediately. Help me embrace these Loves like You embrace them. Remind me daily that they are Yours--beloved, valued, and worthy of my best. Help me be the teacher You had in mind for them. Help me learn their stories. Help me be a light. I am way behind on posting materials for AP Calculus, but better late than never, I suppose. 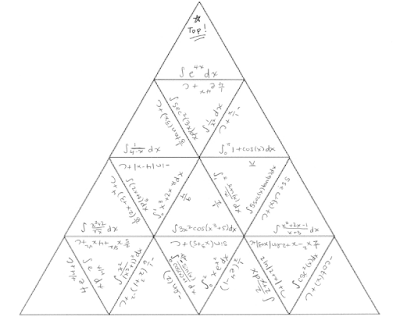 Here is a Tarsia puzzle for practicing techniques of integration (specifically for AB). 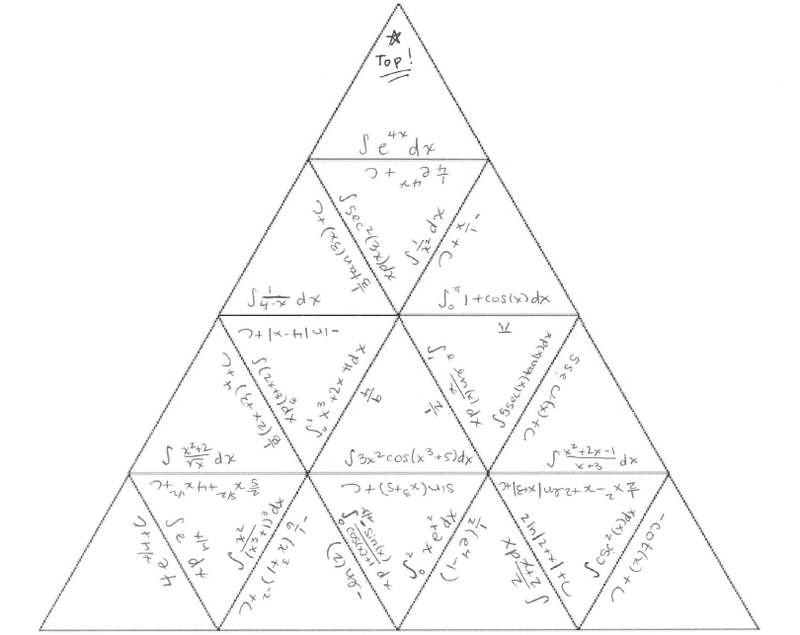 The puzzle includes both definite and indefinite integrals. I used this as an end-of-the-year review before the AP Exam. PDF Version is here. Word document of problems only is here. The word document can be used as its own assignment or only for the students who were absent for the puzzle.